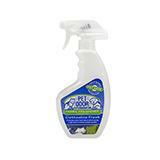 Pet Odor Exterminator Fabric Freshener is great for eliminating odors throughout your home. Use it on carpets, bedding, clothing, sofas, curtains, canvas shoes, pet areas and in your car. Unlike most commercial Fabric Freshener Sprays, this water based formula contains no chemicals and is safe to use around dogs and cats.